What we're covering here: The final battle for Westeros is on, and we're as obsessed as you are. From now through the May 19 finale, we'll be posting GoT news, recaps, predictions, memes and other stuff here. We hope you'll join us. Good, because we all know what happens next: PAIN, and LOTS OF IT. Winterfell is preparing for war. For the common folk, this involves lots of training and fighting and weapons making and giant stick-whittling, but for the main characters, it mostly means chugging fermented goat's milk and hooking up on hay bales. Hey, everyone's pretty sure they're going to die anyway. Everyone except Daenerys, that is. What else would explain her continued preoccupation with ruling the Seven Kingdoms when there's an entire army of dead people at her door? Read the rest of our recap here. Michael Hayes, a 32-year-old welding student in Louisville, asked his buddies at the Knight Welding School to build a life-size version of the iconic throne as a wedding present for his wife Kacie. His version -- made of aluminum -- weighs 200 pounds, has more than 300 swords welded on it and cost more than $7,000. Don't tell Cersei. When we last left Jaime Lannister, he was arriving solo at Winterfell on horseback, wearing a hood and an anxious look. With good reason. The last time he was there, way back in "Game of Thrones'" pilot episode, he pushed young Bran Stark off a Winterfell tower, paralyzing him and setting in motion seven seasons of betrayals, murder and power grabs. Let's just say Jaime is not popular with the Starks. So a new HBO publicity photo from tonight's Episode 2 has people talking. It shows Jaime -- who exchanged a long, portentous stare with Bran upon his arrival last week -- standing unarmed in a Winterfell hall, surrounded by soldiers and looking very much like's on trial. Or pleading for his life. Maybe he'll come clean about Cersei's latest treachery. Maybe he'll offer to lead the charge against the White Walkers in the upcoming Battle of Winterfell. We'll find out tonight. Sweet relief! "Game of Thrones" is finally back, and to celebrate, everyone gets a reunion! Jon and Arya! Gendry and Arya! Jon and Sam! Tyrion and Sansa! Jaime and the creepy omniscient child he pushed off a tower mid-coitus all the way back in the very first episode! Bet you didn't see that one coming (unless you're Bran). Wondering what you'll need for your watch party tonight? Or the next six Sunday nights? John Bradley (Samwell Tarly) and Kristofer Hivju (Tormund) are here to help. "What's a must-have for a 'Game of Thrones' watch party?" Bradley wonders aloud in a video posted to Twitter. "Lots of tissues, lots of friends, lots of emotional support." And "Doritos," he offers helpfully. "A sword," chimes in Tormund -- oops, we mean Hivju. "I think if you're going to have a real 'Game of Thrones' party you need swords. Alcohol and swords." Alcohol and swords -- what can go wrong? Don't forget to serve Hot Pies, Chicken Littlefingers and lemon cake. And if you're not a "GoT" fan but you're going to a party to see what the fuss is all about? Sit down and be quiet. That's all you need to do. After eight years, seven seasons and 67 episodes, even the most diehard "Thrones" fans might not remember everything. Our "GoT" interactive guide is here to help. Track your favorite characters and relive major moments from the first seven seasons. We'll be updating it with all the new developments throughout Season 8. In the final few episodes, basically every detail, line of dialogue and theory from the past seven seasons could very well be at the center of some mind-blowing revelation. However, a LOT has happened, and you'd be forgiven if somewhere between the Red Wedding and Margaery Tyrell becoming green mist, the section of your brain devoted to "Game of Thrones" deep cuts got a little overloaded. Ramin Djawadi says he was aiming for iconic status when he composed the theme music to "Game of Thrones." 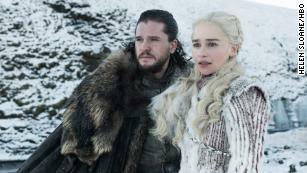 "I wanted people to, when they hear this melody, that they know our show is about to come on, and just get ready and sit down and get in the mood," Djawadi says. It's fair to say he succeeded. The opening bars of his pulse-pounding score inspire an almost Pavlovian response in fans eager for GoT drama. Watch as the "Game of Thrones" composer talks about creating the music for the groundbreaking series.